What you are missing here is a rational criterion. Why is 70% high and not low? You seem to be talking about gut feelings and discomfort, not serious limits to debt. Japan has debt of 2 times GDP. Are they facing revolt in the streets? No. Taking historical levels alone is not necessarily helpful if the mechanisms involved are not clearly understood, but are simply analogized with household budgeting, which is not analogous at all. The one concrete item you point to is the ongoing servicing cost. But even that is not really the key element, since barring inflation, more money can be printed to service this debt at the will of the federal government. The real limit is inflation. If the stock of money and credit exceeds the real capacity of the economy to produce goods, then inflation results. Japan is fighting deflation, despite all its debt. We flirted with deflation, but seem to be back on an even keel now, after huge fiscal and monetary injections. So the bottom line is that if we can though prudent fiscal and monetary policy keep inflation under control .. which means in general keeping the state economic demand within the bounds of its demand displacement through taxes, debt issuance, etc. .. then we will be fine, even with very high debt levels. I think that inflation is now pretty well understood at the Fed and other relevant levels, so we can be pretty confident that the debt levels will not be a problem as far as we can tell. I don't altogether buy this argument, but it caused me to think a little more carefully about my views on the subject. Firstly, debt, for a government, as for any other economic actor, is a promise to provide things of value in the future in exchange for things of value now. The interest on the debt is an incentive for the lender to take the risk that the promise might not be fulfilled in full. Now, the ability of governments to provide things of value to their creditors derives entirely, over the long haul, from their willngness and ability to tax their respective economies at a rate that exceeds their non-debt-service expenses. In real goods-and-services terms, the government needs to be able to divert some of the productive capacity of the economy to the benefit of the bondholders, and away from the benefit of other stakeholders in the economy. Let's think about it from the perspective of the bond purchaser. If I'm going to buy a 30 year government bond at X% interest, I need to feel reasonably confident that over the next 30 years, I will be able to exchange the payment stream associated with that bond for goodies, and in particular that the government will be in a position to provide me with money that I can exchange for those goodies. If I'm concerned that the bond might turn out to be worth significantly less than I'm paying for it now, I'm going to demand a higher X to take that risk. Now, as a potential investor in government bonds, the government's ability to print money is not a benefit that makes me think "Oh, I'm more willing to loan to this government because it can always repay me with printed money". Instead, that's one of the risks of loaning to governments! I have to feel that the government is sufficiently committed to containing inflation to a narrow band over the next thirty years that the stream of payments from my bond is still going to be worth what I paid for it plus a little extra. So I certainly don't want to hear about how the government feels comfortable borrowing ever more because it knows it can always print money in the worst case. And in particular, modern governments have evolved institutions (such as independent central banks) to try to make this guarantee credible. So, my view is that the government's credibility as to being able to service its debt is the key issue. It's not, obviously, that it has to run a primary surplus every year (ie that revenue exceeds expenses before debt service). But I need to feel that if push came to shove, the government will always be able to raise taxes and or lower expenses in order to provide me with the economic benefits associated with repayment of my bond. But now, here's where the situation does get very tricky. The government's future cost of debt service depends on interest rates, which in turn depends on the perceptions of my fellow bond-holders. So now there is a collective herd-action aspect to the situation. As long as bond investors generally trust the government, the government may be able to manage its debt fine. But if bond investors collectively lose confidence in the government, their loss of confidence sets in motion a self fulfilling prophecy - they demand high interest rates, and now the government cannot credibly service its debt. This is exactly what has just happened to Greece. 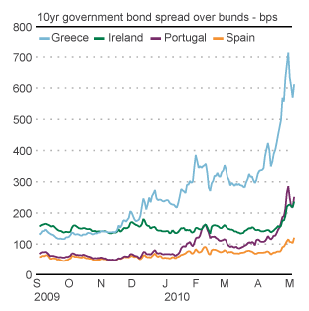 The graph above is the most recent I could easily find (from Reuters), but it would look a lot worse now in early May. The graph above (from Reuters) shows the situation through early May. You can easily see the suddenness and severity of the onset. So governments can experience a run on their debt. The fact that the debt is domestic versus external is a detail (albeit an important one). External debt has an additional risk factor (exchange rate movements), but it's still perfectly possible to lose confidence in the ability of the government to service domestic debt. If a government mainly has domestic debt, and has it's own currency, that's certainly helpful to a domestic debt holder since I am likely to mainly buy goods and services in the domestic currency, and so I am somewhat less likely to be affected by devaluation of the domestic currency - though obviously I want to consume some imported goods, so I am affected to some degree. And, it certainly doesn't mean the government's capacity to borrow is infinite - I still want to know that the government can credibly service its debt in the future. If I think it might well default, or inflate, then my X is going to go through the roof. In particular, if it appears that the government is going to have to run ever-expanding deficits as far as the eye can see, clearly that cannot go on forever, and is likely to end in either default or inflation. Demonstrations against tough new austerity measures in Greece turned deadly on Wednesday, as three people were reported to have died inside a bank building set ablaze by protesters. The reports of deaths came as workers across Greece went on strike over deep spending cuts and new taxes aimed at staving off economic collapse. Tear gas billowed across the central Sintagma Square in front of Parliament as demonstrators trying to storm the Parliament building hurled rocks and gasoline bombs. Police responded with tear gas canisters that spread a choking pall of smoke. Tens of thousands of people had converged on the city center as part of a general strike that paralyzed flights, ferries, schools and hospitals. At one point, Reuters reported, protesters set fire to a building and a witness saw firemen evacuate at least four people. “There are probably people trapped in the building,” fire officials said in a statement before the news emerged that people trapped in the building had died. The police blamed what were called “hooded youths” for setting fire to the building. The Greek fire brigade reported that three people died in the building, according to The Associated Press. The demonstrations were the first major protests since the Socialist government of Prime Minister George Papandreou unveiled belt-tightening changes on Sunday that amount to the biggest overhaul of the state in a generation. At risk of considerable over-simplifying, Greece appears to be a nation with more than its share of tax-dodgers, public service workers with an over-strong sense of entitlement, and rioters, whereas the Japanese have more than their share of workaholic perfectionists who prize order and commitment to the collective welfare. Thus the right to tax the Japanese economy is a significantly more credible commitment to repay than the right to tax the Greek economy. Therefore, the Japanese government can borrow more than the Greek government before losing the confidence of its creditors. So, in applying this kind of thinking to the US, we need to think about how politically plausible it is that future US governments will be able to raise revenues above expenses. But more on that will have to await another day. Thanks- that was a very good discussion. All I'd add is that inflating a debt is a lot less painful (within bounds) than reneging on it for all concerned, so there is a significant distinction. Neither is desirable, certainly. Much of the general confidence required for debt concerns prospects for overall future economic growth. In that regard, Greece is really being hammered by the proposed austerity programs. It's a lose-lose situation right now, since brutal cuts in the (admittedly bloated) public sector are going to reduce overall economic activity for a long time. Burk - there are degrees of default too - outright nada is not the usual situation - rescheduling payments, partial writedowns, negotiated reduction in interest rates have all occurred. Which is worse from the bondholders perspective just depends on the exact numbers. I was in Junior High (Middle) School in Texas during WWII. I recall some of us worrying about the debt even then what with all the 10 cent war stamps and $25 bonds. I distinctly recall our Civics teacher saying don't worry, we owe it to ourselves. During the 60's some of my professional friends were complaining about the growing debt. I tended to joke - don't worry we can inflate it away. At about the same time I became a fan of Franz Pick who wrote about the WWII turmoil in Europe. I also recall with some nostalgia all of the wonderful things that I could buy with 5 cents. Of course I only made 25 cents an hour mowing yards. There was a time that inflation worked reasonably well as a hidden tax. That day may be gone?? This is not quite true for governments. They promise to pay in their own currency, which is nothing but more debt. A Federal Reserve Note is just that, a note like any other. It is the population as a whole that is required, by law, to give something of value for this note, that is, to redeem it. It is, by law, legal tender. Of course these notes are just passed around, never redeemed, so the one who issues them, the government, gets free money, just as I would if I could write a note for money and never have to redeem it. The government has nothing of value to exchange for a Federal Reserve Note. They will just give you another note or, perhaps, a Treasury Bill. This is just exchanging one form of debt for another. Now we are required by law to accept dollars, but no one can tell us just how much of whatever we will exchange for them. For if this were fixed that would be the end of fiat currency. As long as there is fiat currency the government really doesn’t need taxes. By issuing new Federal Reserve notes it is, in effect, borrowing from its population. And this debt never needs to be paid back. Taxes only serve to limit this debt creation somewhat. Of course in the present situation the population has no possibility of giving, now, or in the foreseeable future, anywhere near the value for the outstanding government debt that people expect. What they expect is roughly what they could get when they obtained the dollar. If inflation (a misnomer) proceeds too rapidly, they won’t accept it at all, or will, if they have too, continually overprice to anticipate future inflation, thus making inflation exponential. Today, the dollar continues to float because other people in other countries, who have no obligation to do so, accept it for things of real value, like oil or manufactured goods. It is dollar hegemony, not taxes, that keeps the dollar afloat.